Bormioli Rocco is the king of distinctive, elegant Italian glassware, and this swing top flask is a prime example of their exemplary work. It’s perfect for liquor, sensational for salad dressings or your own maple syrup, and absolutely awesome for anything else you want to share with your friends or family. You can trust the swing top rubber stopper to keep the contents safe and sound and the polished glass cleans right up with a bit of hand-washing. Call it a glass flask or call it a glask, but make sure you’ve got one on your table! 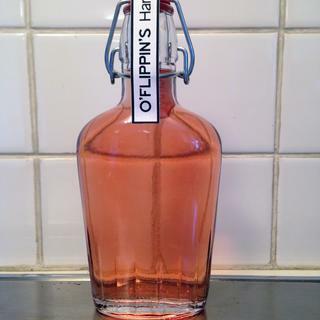 I bought several of these bottles to give as holiday gifts filled with homemade liqueurs. The quality seems very nice with thick glass and a strong swing-top making a good seal. Their overall appearance and function is great! Our bright homemade limoncello will make beautiful Christmas gifts in this bottle! This looks like the perfect bottles for our holiday guest gifts, to share homemade Lemonceillo and Blueberry-Cinnamon Liquor. Have liqueurs brewing for X-Mas Gifts forBasket Stuffers. I use these flasks every year for homemade Irish Cream to give as gifts for Christmas. These flasks are pretty and seal tightly. Making my own liqueur this year to give as gifts for Christmas. Glass flasks are the way to go!